Ebony Walden joined the RVA Rapid Transit staff in August. 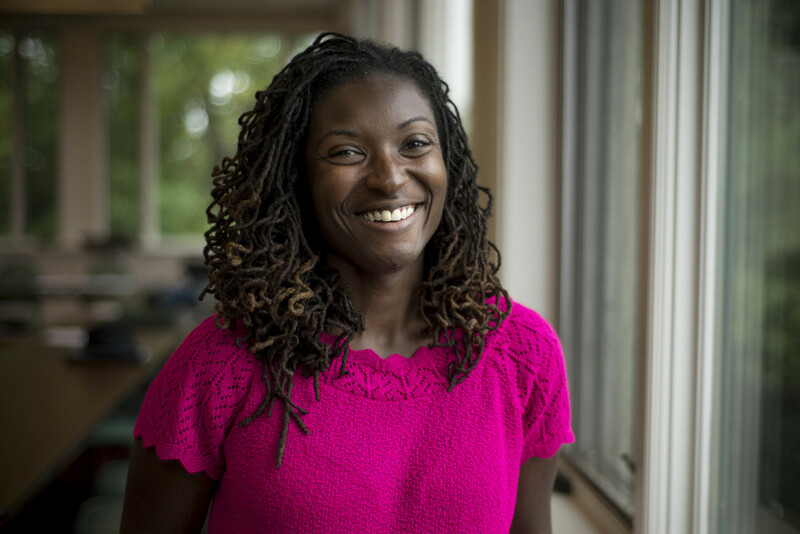 Ebony has 9 years of City Planning experience and will be working to coordinate future efforts. 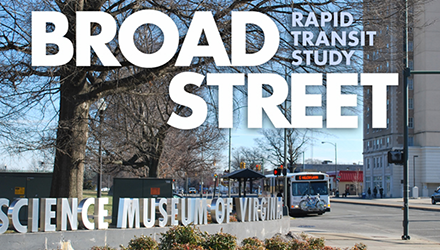 In 2015, RVA Rapid Transit will help garner support for a land use and economic development vision along the Broad Street corridor to compliment the BRT project and ensure its success. We will also continue to promote the regional vision. Contact ebony@rvarapidtransit.org if you know of an organization that would like a presentation or if your organization wants to officially support the regional BRT vision via letter or resolution. Dominic Carter joined the RVA Rapid Transit staff in November to focus on Church and Clergy Relations. Churches have played a significant role in our promotion and advocacy efforts as mission driven social institutions with multijurisdictional membership. Dominic will organize clergy and churches in Metro Richmond to promote and advocate for a BRT focused regional transit system. If you would like to get your church involved please email dominic@rvarapidtransit.org. In September, GRTC received a $24.9 Million federal grant to fund the Broad Street BRT project. The project will service a 7.6 mile route from Rocketts Landing to Willow Lawn, including 14 stations and over 3 miles of dedicated travel lanes. The design process is underway, with construction starting in 2016. Service is expected to begin in October of 2017. For updates and more information go to www.ridegrtc.com/brt . Richmond Magazine wrote a recent article on the Broad Street BRT. Southerner increasingly want to be taken for a [transit] ride! Virginia Transit Association has launched a new e-action program to direct folks to their legislators when it’s time to push support for transit. This program allows target alerts for any level of government – even the local level of Board of Supervisors! To register go to the VTA website: www.vatransit.com. In a recent post, our team at RVA Rapid Transit reported on State Delegate Manoli Loupassi’s efforts to bring the City of Richmond, Chesterfield, and Henrico County together in what House Bill Number 597 is calling the “Richmond Regional Transportation Authority.” House Bill 597 would make some significant changes to the current Richmond Metropolitan Authority (RMA) by equalizing the membership distribution of a sixteen-member board. The City of Richmond and the counties of Henrico and Chesterfield will each have five members on the board, one of whom may be an elected official from each of the jurisdictions. Previously, the Authority consisted of eleven members, one appointed from Henrico, one appointed from Chesterfield and three appointed from the City of Richmond. Equal representation on the Authority would be the first step to greater regional cooperation around transportation in Metro Richmond. In other words, this bill would provide the political structure for a regional transit system. This is a vital step the State House of Representatives is taking toward a more cohesive transit system for the Richmond Region. House Bill 597 will be voted on in committee on Friday. The new year brings new efforts for regional cooperation in Metro Richmond. One of these efforts is being lead by State Delegate Manoli Loupassi, who is the only delegate in Virginia to represent the City of Richmond, Henrico and Chesterfield. According to the Richmond Times Dispatch, Loupassi is proposing legislation that would give Chesterfield and Henrico equal representation on the Richmond Metropolitan Authority (RMA) board. This change has been on the legislative agenda for Henrico and Chesterfield since the beginning of the 48-year-old institution, which mainly operates toll roads in Metro Richmond. The legislation would require that all three jurisdictions agree on a project before it could be undertaken. Such legislation could pave the way for a larger Metro Richmond transit authority. Regional cooperation is vital for the Richmond metro area to obtain federal funds for transportation and infrastructure development. That’s why Loupassi is seeking to expand the authority of the RMA or to form a new regional body. According to a recent article in Richmond Magazine, Loupassi will introduce legislation into the General Assembly that would join Richmond localities in a partnership to manage and maintain roads shared by all Metro Richmond residents. Loupassi is calling this new body the Richmond Regional Transit Authority. Though it would not initially include public transit, Loupassi sees it as a first step to a group that would one day administer public transit in the greater Metro region. RVA Rapid Transit supports taking steps to achieve the goal of connecting our region using an efficient, effective system of rapid mass transit. The need for public transit and the job access and economic development it provides is becoming increasingly evident to both city and county citizens. Chesterfield county alone has seen a 75% increase in its poverty rate over the last ten years. Many of these individuals need access to job training and employment through public transportation. And regional businesses need access to the workforce that would be available via a rapid transit system. The Richmond Regional Planning District Commission (RRPDC), recently held its annual breakfast, where it laid out its Comprehensive Economic Development Strategy (CEDS) for the Richmond Region. A need for greater access to transportation was one of the main findings of the study. The study found that 18% of households in the City of Richmond alone do not have cars, and 27% have only one car. CEDS pointed out that the Mayor’s Anti-Poverty Commission called for the development “of a functional regional transit system.” The CEDS recommended beginning with incremental steps such as giving GRTC control of bus route changes instead of having city Council approve them, a recommendation that has been implemented since the report was written. It’s encouraging to see Delegate Loupassi, other elected representatives and government administrators working to create a more prosperous, connected and unified Metro Richmond. But our elected officials and the civil servants who implement policy are constrained by what they believe to be politically possible and what they believe their constituents support. Bringing rapid transit to Metro Richmond is more than possible as long as residents of the region raise their voices and let their representatives know that exceptional public transit is a priority. In the coming months we will be organizing opportunities for you to make your voice heard, so be sure to stay tuned. Bus Rapid Transit (BRT) benefits people of all demographics and backgrounds. Whether you’re a business professional who lives downtown and would rather not brave interstate 64 to get to work in the West End, or a VCU student without a car who would like to experience everything that Richmond has to offer, RVA Rapid Transit is designed to serve everyone who wants to ride. BRT will be particularly effective in addressing the needs of our senior population. Providing them with adequate transportation options will be increasingly difficult as the baby boomer generation reaches retirement age. According to a Brookings Institution Study, by 2030 one in five Americans will be over the age of 65 and one in 11 Americans will be over the age of 85. According to a Transportation for America Study, many of these seniors tend not to move after they reach retirement age, preferring to “age in place” ( pg 3). Additionally, a 2004 study found that seniors age 65 and older who no longer drive make 15 percent fewer trips to the doctor, 59 percent fewer trips to shop or eat out, and 65 percent fewer trips to visit friends and family, than drivers of the same age. And a 2008 study by AARP found that 85% of older Americans were extremely concerned or very concerned about rising fuel prices, causing them to consider alternative modes of transportation. 20% of seniors over the age of 65 do not drive at all. The Brookings Institution study notes, “over the last decade older people have made less use of public transit. However older people would consider using this mode if services were provided in ways that better met their needs. To make transit services more appropriate for older people, federal, state, and metropolitan policies and programs should encourage or require, as well as finance, four major categories of public transit developments: improving conventional service, increasing safety and security in all parts of the system, enhancing communication and information, and providing additional services more carefully targeted to the elderly.” Both the Transit for America Study and the Brookings Institution study suggest designing public transit to be accessible to seniors and making pedestrian sidewalks safe and accessible for seniors. An Engaged Community that gives back through civic participation and volunteerism. A Livable community that has affordable housing, accessible public transportation, and makes the effort to comply with the Americans with Disability Act (ADA). A Stable community where adults have access to jobs that provide financial stability and allow people to save for retirement. A Well Community that provides for the medical needs of an aging population. 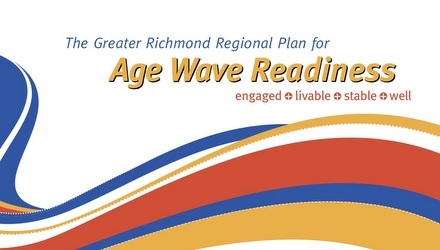 RVA Rapid Transit is an important step toward making the Richmond region more liveable for seniors. This system of rapid mass transit will allow them to “age in place” while retaining access to the services they need and the amenities they enjoy. The GRTC and the DRPT held an open meeting recently to present an update on the Broad Street BRT project. The crowd was between 150 and 200 by our rough estimate, and many of those in attendance were RVA Rapid Transit supporters. Most of the presentation was a review of the proposed plan to build a BRT line between Willow Lawn and Rocketts Landing. As far as the system goes, there were no material updates to the previously proposed build. What has changed slightly is the Federal Transit Administration application process. Since the last presentation of the Broad Street BRT plan, the FTA has updated its process to require additional analysis. DRPT estimates that this will take an additional month or two; however, the process is now more streamlined with only one point of review by the FTA instead of two. This should streamline the approval of the Broad Street corridor BRT in the long run. Organizers of the event were pleased with both the size and the positive energy from the audience. Larry Hagin, GRTC's Director of Planning, expressed that he was encouraged and excited by those in attendance. He reiterated that this is just the first step to building a larger system. Officials from Henrico County, including County Manager John Vithoulkas, Director of Public Works Steve Yob, and Transportation Development Division Director E. Todd Eure were in attendance, and voiced support for cooperation among the Metro Richmond jurisdictions. Public sentiment at the meeting was supportive of the Broad Street BRT. There were no voices dissenting, and the audience's primary question was, "How do we expand this to a regional system?" It is our hope that the supporters of RVA Rapid Transit and Metro Richmonders at large can continue to ask these questions of our elected and appointed officials.